ABB are leading providers of propulsion and power systems for big vessels. And naturally, the user interface must also reflect the quality of the system. After a proper makeover, the solution was installed in the Oasis of the Seas, with the impressive capacity of over 6000 passengers. One of EGGS’ missions is to embrace complexity, but achieve simplicity. This project is an excellent example of this, where we challenged and prioritized every detail of the interface. The layout, graphics and colours were carefully balanced to promote situation awareness, and offer easy drill-down to details rather than bombarding the user with clutter. What do you do when deadlines are short, but quality cannot be compromised? Forget documentation! Instead, you put the designers and developers in the same room, and make sure they have what they need to work with smooth iterations. 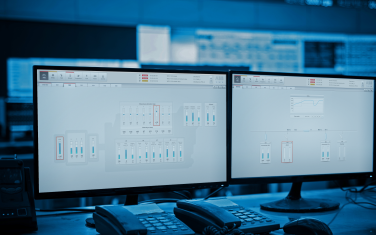 This new interface for ABB Marine went from idea to finished solution in just about half a year. That must be some kind of record for heavy-duty maritime applications.